This song was written for the 1953 MGM musical The Band Wagon, which starred Fred Astaire. 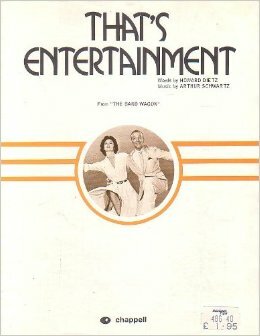 It also served as the theme song for the very popular That’s Entertainment movie, released in 1974, with the greatest MGM musical songs and dances. Or the scene where the villain is mean. Or the ball where she gives him her all. a gay divorcee who is after her “ex”. and causes a lot of bother. Who is thrown for a loss by the skirt who is doing him dirt. “That’s Entertainment” was recorded in July 1993 and was released that year on Steppin’ Out. It was arranged by Tony Bennett and Ralph Sharon.